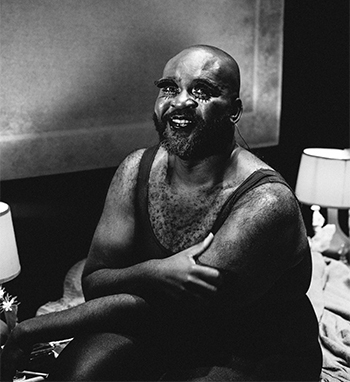 Le Gateau Chocolat stars in the autobiographical ‘Black’ at the Theatre Royal Stratford East. The show chronicles his life from his childhood in Nigeria to the present day, complete with a live orchestra. The former Law student tells Afridiziak why the entertaining yet emotionally stirring show is as unconventional as his route into show business. Black is more than a drag performance. Describe the show for someone who doesn’t know what to expect. If you come having watched RuPaul’s Drag Race or with your preconception of what drag is, I’m not sure that’s not what you’re going to get here. The drag is the vehicle to deliver a reality that not only I experience but that many across the globe do. All the blurb surrounding the show is linked to talking about depression so it’s really interesting that despite our best efforts people still come with what they traditionally expect a drag show to be and that’s not what this show is. He is also keen to expand on the meaning behind the show’s title. The concept of ‘black’ manifests itself throughout the performance. That’s not just black by colour, that’s all the things surrounding it and that’s what we deal with in the show. From black colour to black music to black and blue to black sheep to black comedy. For anyone in the entertainment industry there is the added shame or remorse of ‘I can’t be seen to be depressed because by every standard I am successful’. The subtitle of the show is the Maya Angelou quotation, ‘there is no greater agony than bearing an untold story inside you’. Has there been a relief that comes with telling his story? It’s still difficult but what it does encourage is me to not only eulogise my friends who unfortunately have committed suicide in the past five years, but it also encourages me to engage with my depression and not deny that it is there. It is still a taboo in our society until we keep breaking down the stigma. I think the more we talk about it the more we recognise that it isn’t something to be afraid of or ashamed of. In the same way that if you had a cold or the flu or a chest infection or you broke your arm you would go and see a doctor. I’m not saying that the only route is a medical one but if something isn’t quite right then talking to someone and sharing it does alleviate some of the burden. He then lists famous figures who have been vocal about mental health recently, such as Stormzy. We talk about the stigma of mental health, particularly within the black community. I think it is also complicated by being a black man. There’s a real kind of link to toxic masculinity where men are encouraged to not be able to cry or not be able to be emotional or to feel because that’s defined as weakness. For anyone in the entertainment industry there is the added shame or remorse of ‘I can’t actually be seen to be depressed because by every standard I am successful’. The reality of it is that before he is a musician, before I do drag, before I am an opera singer, we are all human beings and I think people forget that. Le Gateau Chocolat’s own experience with depression is an important part of Black. I ask what he hopes it will add to the conversation? For me I think one of the purposes of the show that I hope it achieves is a political statement in that I hope that someone who is experiencing depression, or has had difficulty in talking about it, finds the courage to talk about it or to recognise that there are other people like them. The show is entirely autobiographical so I wonder what it is like for the performer to be so vulnerable on stage, especially with his loved ones in the audience. Pretty hard because I think some of them didn’t know about the depression when that started. They didn’t know about some of the things I was saying had happened. Art should comfort the discomforted and discomfort the comforted. If your living in a privilege bubble then my responsibility is to tell the truth, my truth, and I hope that truth pricks your privilege so that you understand that the things you see as innocuous or mundane are things that people actually have to fight for. It is clear that Le Gateau Chocolat believes wholeheartedly in representation, knowing first-hand what it is like to not have people like you to look up to. Representation is important because I think these stages and entertainment, these platforms, raise the dreams and ambitions of the generations to come. He not only talks the talk but is willing to walk the walk. Last year, his show DUCKIE, a retelling of The Ugly Duckling, was inspired by his nieces. I want my niece to be able to go to a show and not just be entertained but also leave with the perceived positive of ‘I can do that as well’ and I don’t want that to be limited to her going to see the Lion King. The key thing is to connect with someone and in a theatre of 400 people I hope that more than one person leaves with an element of recognition: they see themselves on stage, they see themselves represented, they see mental health depicted with care and that’s the thrust of why I do this. I can either wax lyrical about it or make work that crystallises what I’m talking about. We need to encourage diversity not just to have the discussion but also to actually make it happen. Did you envision whilst growing up in Lagos that you would be doing this? God no. that is rather the extraordinary thing. To stand on that stage was an extraordinary feeling of achievement. I will never take this for granted because it’s still a huge risk to take on the black, gay, Nigerian show but they [The Theatre Royal Stratford East] are saying that they feel it’s a voice that should be heard in the cacophony. His success is even more remarkable, considering that he graduated with a Law degree from Sussex University in 2003. For all intents and purposes I was going to be a lawyer. I didn’t go to theatre school, I didn’t train in opera, I didn’t study drag. I just wanted to sing. How did those closest to him react to his decision to leave Law behind and pursue entertainment? I think that’s still an ongoing battle – they weren’t jumping with joy because I think the first thing that comes to mind is ‘well you can’t make a living from that’. So what advice would he give to anyone facing a similar situation? I think it’s a matter of bravery and courage. I needed to have an answer to myself to the question ‘what if?’. No one can answer that question but you. I needed to be sure I had a reasonable answer for myself when I turned 35. If you don’t try you’ll never know. It’s rather a cliché but I think it’s better to try and fail than not to try at all. The show’s repertoire features everything from Whitney Houston to Wagner. 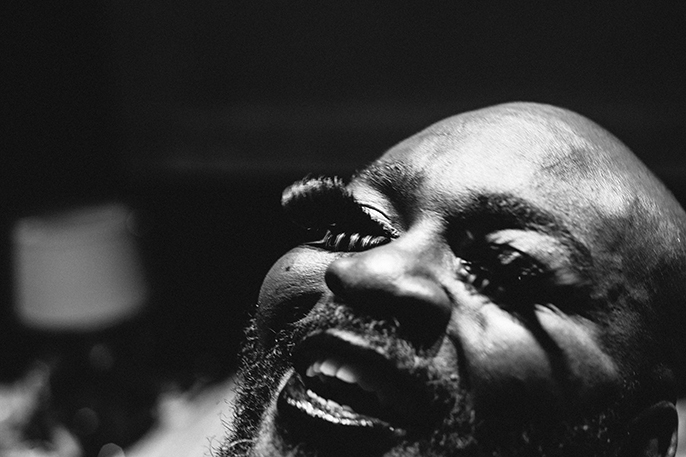 As an opera singer and cabaret artist music plays an important role in Le Gateau Chocolat’s life. How did he decide on the music for the show? I made a list about seven or eight years ago and I continue to expand that list of songs that I’ve heard or were part of my life at some point. It could be songs that I don’t necessarily like but they punctuated something that was meaningful to me so I like to perform them, songs I hope that have sound tracked many people’s lives and not just mine. Despite exploring sensitive topics the performance has been praised for its ability to maintain the balance between the entertaining and the emotional. I ask what he attributes this to. I think it’s to be real and to be honest - even in our deepest, darkest moments sometimes the funniest things happen and I think to deny that is to mislead. I think the balance is one that was possessed with the help of my friend and director, ed Byrnside, but is one that is inherent in who I am. It is clear that authenticity is of the utmost importance to him. If I remember to be honest and true it makes me impervious to criticism or reviews. I hope we get great reviews, because of course that’s how we sell the show, but the truth of the matter is this is my life, this is my story. The key thing is to connect with someone and in a theatre of 400 people I hope that more than one person leaves with an element of recognition: they see themselves on stage, they see themselves represented, they see mental health depicted with care and that’s the thrust of why I do this.